Half a year ago I moved to Amsterdam. Great city, many interesting people, many cultural events, vast amount of bars, ... How to find your way around, how to meet great people, the right places to eat, the places to buy honest ingredients, ..? I put my money on Twitter and got lucky. Twitter got me in touch with new media researchers, promising entrepreneurs, social events, #blog08, ... it even got me interviewed in a large newspaper. Twitter is a multi-tool and I like it! 836 tweets in 3 months got me connected with 50-60 people. 15 of them I actually met in real life. 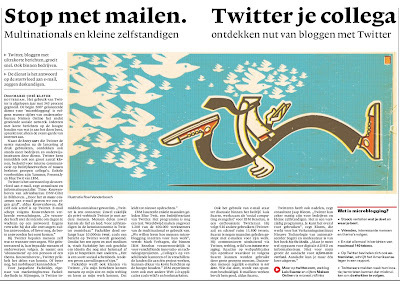 NRC / nrc next journalist Marie-José Klaver interviewed me about the role of Twitter in organisations, specifically about its role as a knowledge management tool. congratulations! saw the article, too!